Our Cider and Perry Trials will take place on Saturday 4th May 2019. Please read the following before entering! Competitors must bring their entries to Putley Parish Hall between 9.30am and 11.30am on Saturday 4th May. For each entry in a draught class, you will need to bring it in a clean, clear, unmarked, glass 1 gallon (5 litre) demi-john with a removable label (which we will supply) showing your name, the class entered (see Rules for definition of classes), and the product’s specific gravity. The demi-john must have a correctly fitting cork or rubber stopper. Entries not meeting these requirements will NOT be accepted. Empty demi-johns will be available to replace the demi-johns that you have brought on a first-come, first-served basis while supplies last. Alternatively you may reclaim your demi-johns and their remaining contents between 4pm and 5pm on Monday 6th May at the end of the Blossomtime events in the Parish Hall. For bottled-fermented/bottle conditioned classes entries must be in two heavyweight punted 75cl glass bottles with correct closures for each class entered, each bottle with a removable label showing your name and class entered. Typically these will be bottles over 500g in weight (empty) suitable for use with wired corks or crown caps. You can enter up to a maximum of five classes in the main competition, with one entry and one vote per class. We accept that at the time of submitting an entry the final SG of your samples may not be known and you may change classes on the morning of the trials, provided that you still do not have more than one entry in any class. The closing date for receipt of entry forms is 12.00 noon on Saturday, 27th April and no more entries will be accepted after that time. Judging is carried out by the makers – there is no panel of judges. Each entrant receives a voting slip for each of the classes they have entered and, when judging opens all the entries in the draught classes will have been decanted into numbered flagons. 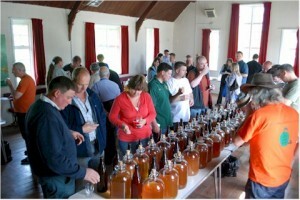 The contents of the bottled classes are presented to the judges in unmarked glasses to sample. In the draught classes a maker may bring an assistant to help with judging. Judging for the bottled classes will commence at 12.30pm for Class P (bottled perry) and 1.00pm for Class C (bottled cider). Judging for the remaining classes will commence at 2.00pm. The competition ends at 4.30pm and the results will be announced approximately 30 minutes later. There are also draught classes for novices, that is, anyone who is new to cider and perry making, having made it for 3 years or less and having not won a prize at any previous Big Apple event. Novices may make up to two entries, one in each novice class. You may not make entries in both Novice and Main classes*. Absolute novices are welcome. Alternatively you can download and print an entry form (suitable for main or novice competition) and post it to us with a cheque. Before entering do read the rules! * Occasionally we do not receive enough entries in a novice class to make up a competition – in this case we give the contestants the option of a either a refund or to have their entry judged in the equivalent class in the main competition. All available sales tables have now been taken.